Kew type mercury barometers used for testing and calibrating altimeters are difficult to use. Each mercury barometer must be corrected for temperature, altitude and latitude using complicated formulae and / or charts. The vernier scales require considerable practice in order to be read correctly. Transporting a mercury barometer is extremely difficult, (air transportation of mercury is illegal) consequently annual calibrations are costly and time consuming. ADI has therefore developed a direct digital replacement which is safe and easy to use. 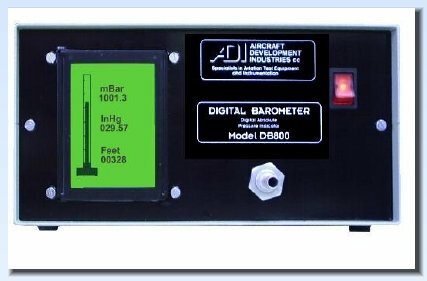 The Model DB800 Digital Barometer is highly accurate, entirely solid state with no moving parts and displays absolute pressure in millibars, inches mercury and altitude in feet, directly on a graphic LCD display. No correction charts are necessary.